The Lion King - Diamond Edition DVD Review The film itself is a study in animated excellence, and almost two decades on The Lion King still deserves pride of place in any Disney aficionado’s home video collection. 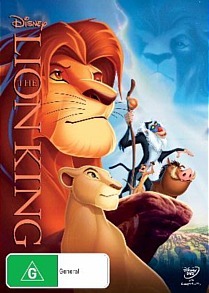 Amongst the highest grossing films of all time and one of the pinnacles of the Disney Renaissance, the period which produced such hand-drawn animated gems as Beauty and the Beast and Aladdin, The Lion King is widely hailed as one of the greatest movies of all time and stands as a work of rare emotional and artistic accomplishment. The story, as we all know, revolves around Simba, the newborn son of the Lion King and Queen Mufasa and Sarabi. Following the death of Mufasa at the paws of his shady brother Scar, Simba, bearing the guilt of his father’s demise, retires to the wasteland to spend a few years wallowing in shame in the company of diverse tuneful wildlife, amongst whom are Timon (Nathan Lane), a wise-cracking meerkat, and a flatulent if well-intentioned warthog named Pumbaa. Much soul searching and more than a few musical interludes later, Simba is finally ready to resume his rightful place at the head of the pride, though he’ll need to defeat the dastardly Scar first. Which he does. Obviously. Disney’s new Lion King Diamond Edition DVD features an impeccable transfer - the stunning colourification and unimpeachable clarity are almost BD-esque in their perfection - and the 5.1 surround soundtrack is likewise a rich and robust affair. The DVD edition is a little lacking in the special features department, containing only a 20 minute interview with producer Don Hahn, and those with a hankering for decent extras will have to fork out for the Blu-ray combo set which includes Deleted Scenes, bloopers, featurettes, an audio commentary and more. Nonetheless the film itself is a study in animated excellence, and almost two decades on The Lion King still deserves pride of place in any Disney aficionado’s home video collection.